Iona Shepherd’s wonderful photographs have been a regular feature on the Riverside Museum blog since it launched in the spring last year. As well as providing a regular Photograph of the Week, Iona’s other posts include slideshows of the work carried out by the project team, from the conservation and decant of the ship models to the 3007’s epic journey from GMRC to Riverside. Today’s Iona’s last day with the project; she’ll be sorely missed. Below’s a selection of some of the photographs she’s taken for the Riverside project. Since the New Year things have been moving pretty fast down on the Riverside Museum site. It’s full steam ahead with locomotives and their tenders being eased into place. All the buses and trams are on site too, ready to be positioned into their final display location. Last week we transported the fire engines down to the Pointhouse site. This week the exhibition install teams started building the display units around them and some of the other large objects. The re-created street, which promises to deliver more than the old Museum of Transport’s well-loved Kelvin Street, has seen the majority of its objects going into the shop units. Many of the bicycles have also arrived on site and been lifted into their dramatic setting. 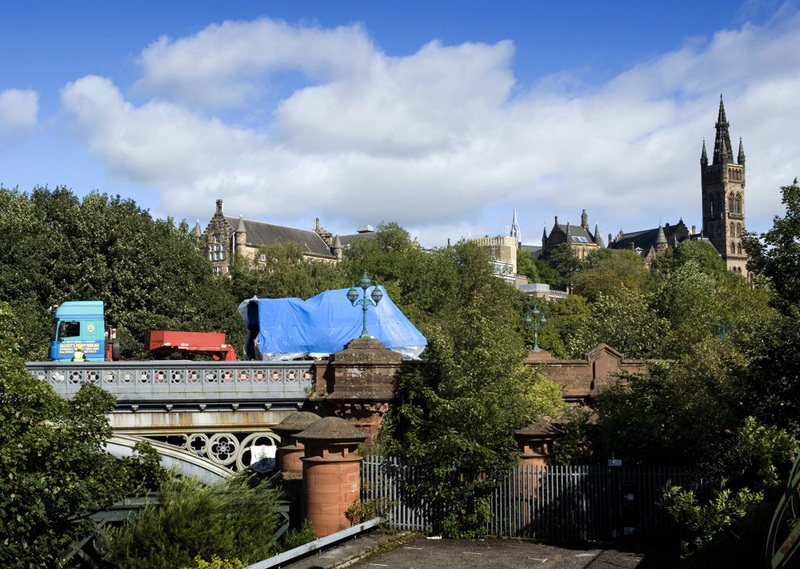 The Faslane caravan, for years a fixed presence at the Faslane Peace Camp, has also been installed at the Riverside Museum; its contents carefully conserved and returned to their original spot, just as former resident and peace protester Disco Dave left them. Outside, the plaza has been surfaced, trees planted, and work’s started on the car park. And only a few days ago, a dredger vessel sailed into the area to begin dredging the Kelvin Harbour. 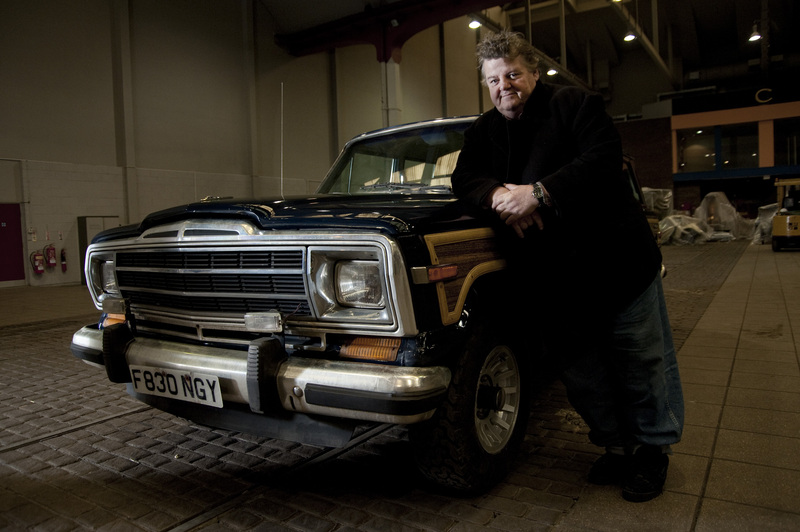 We’re delighted that Robbie Coltrane’s 1988 Chrysler Jeep is going to be one of the objects at Riverside. Here’s a picture of the actor with his Jeep following its conservation at the Museum of Transport in Kelvin Hall. Actor Robbie Coltrane has donated his Jeep to Glasgow's new Riverside Museum. 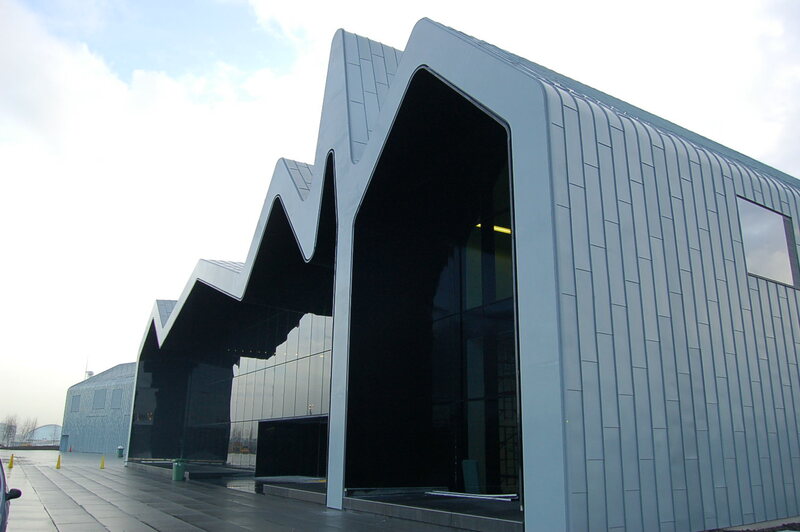 Robbie is also a Trustee of the Riverside Museum Appeal, so it was great to see his donation attract so much publicity. Follow the links to read the Daily Record article, or to listen to the Clyde One interview. The Riverside Museum Appeal has now raised £4million, and in these last few months of the project it’s making a final push to reach its £5m target. You can help by donating online at www.riversideappeal.org or, to make a £5 donation, text “Riverside” to 70700. All donations will be permanently recognised in the new museum. The recent big freeze caused a few problems at the Museum of Transport, but thankfully nothing too serious, and work on the Riverside Project hasn’t been too disrupted. The slideshow above has a few wonderful pictures from the museum’s icy backyard. Throughout this winter, we’ve monitored the enviroment at all times to ensure the safety of the objects. Fortunately, we’ve not had to take any drastic action to protect them; though the plummeting temperatures haven’t always meant great comfort for us! The long process of preparing the Bennie rowing boat for display at Riverside Museum is nearing completion. Back in August, we started the slow process of drying the boat out. Although in great condition, she’d not left the River Clyde, with a few exceptions, since her launch in the 1950s! Bennie is named after her builder, Ben Parsonage, the former Officer of the Glasgow Humane Society. Ben built the boat in the 1950s and in keeping with the tradition of naming the boat after the Glasgow Humane Society’s current officer, it was named Bennie. Ben’s son George, who is himself now Officer of the GHS, donated Bennie to Glasgow Museums earlier this year. With the help of Bennie and the other GHS resuce boats, George and Ben Parsonage are credited with saving thousands of lives. After drying her out, Riverside staff moved Bennie to the conservation lab. There, under the supervision and guidance of conservator Gretel Evens, Museum of Transport Visitor Assistants carefully cleaned Bennie, revealing the different colours on her hull. Now Bennie is ready to be transported to her new home in the Riverside Museum, which is due to open in spring 2011. It’s been a while since our last update on the progress of the clear-out of the old Museum of Transport at Kelvin Hall in Glasgow. As you can see in the slideshow above, the Riverside team have been very busy and the inside of the old museum is now looking very different. Our decant team and contractors have moved all of the trams and locomotives to Riverside. The majority of the motorbikes once on display in the mezzanine level have gone too. With the clearing of more and more space in the museum, the main hall has become a working area for staff. It’s currently full of cars and boxes, crates and ladders. Packing of the smaller objects continues in the stores, while Admin and Visitor Assistants work on the archiving of books and other printed material in our offices. Most of the ship models have moved to their destinations, either Riverside or GMRC. 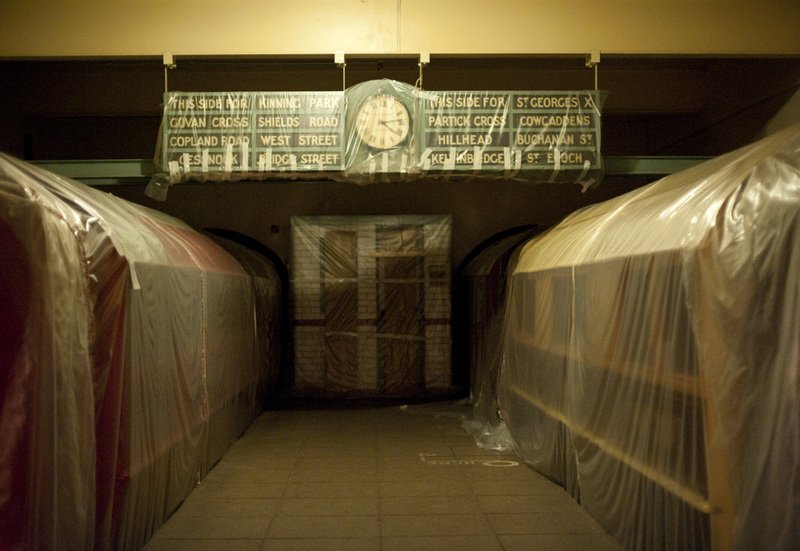 The next big job is going to be moving the cars which are in the main hall cleaned, wrapped, and waiting to go. The dismantling of the displays at the old Museum of Transport is also approaching completion, and you can see the metal walkways that once ran between the trams lying in bits awaiting disposal. There’s still an awful lot of work to do, but the final evacuation and move to the new Riverside Museum looms excitingly closer. Last week saw the turntable ladder on the Dennis-Merryweather TL fire engine raised inside the Museum of Transport for the very first time. We needed to test the ladder prior to its move to the Riverside Museum where it’ll be displayed in a much more dynamic way. During its working life with the Glasgow Fire Service, the engine’s motor would have whisked the ladder up at high speed. Attached to the top of the ladder would be the belt man, whose job was to operate the hose and direct the jet of water onto the fire below. Without the need to save lives, we took our time – several hours! 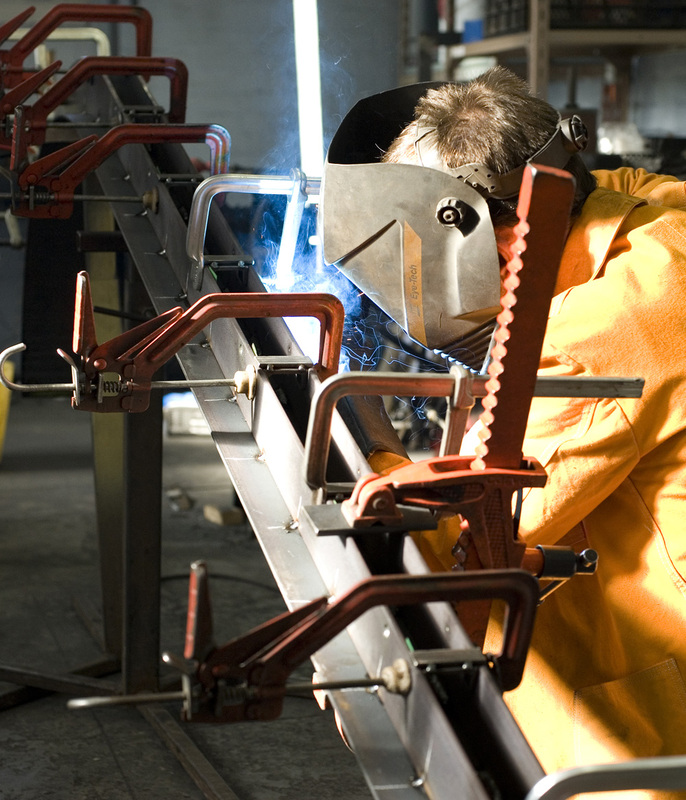 – erecting the ladder. We had to raise the ladder slowly by hand – about o.5° in five minutes! It was extremely slow to say the least, and we all have the blisters to prove it.